Open ended play doesn't just have to be for older children! 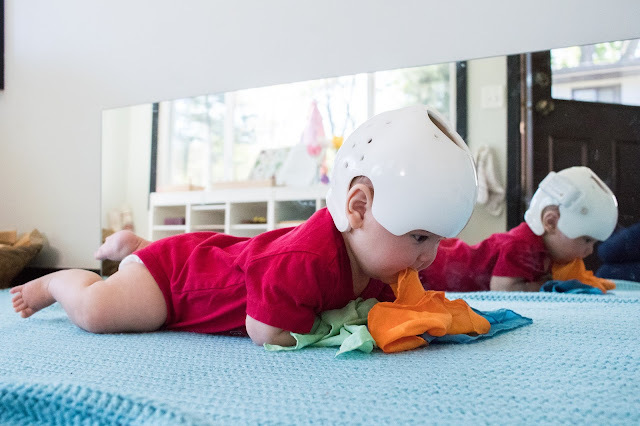 This type of play opens up possibility for movement, exploration, imagination, and more. 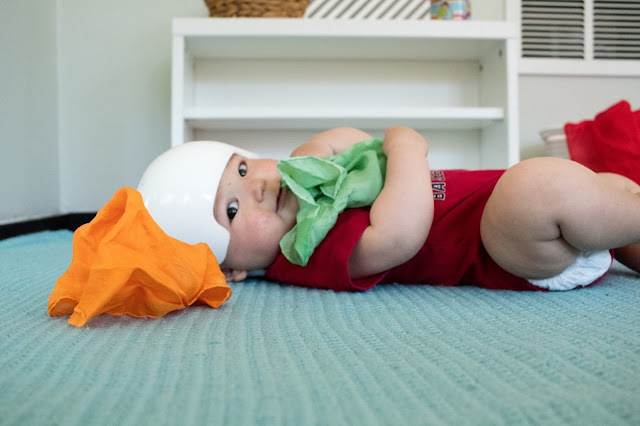 While a baby is limited in many ways, an open ended material gives a baby the chance to truly control the play. It also provides a great chance to get some movement in! Play silks are great for this because they are soft and safe, yet fun! They are airy and move in interesting ways. They feel great to the touch and are beautiful. And, they must feel great to eat -- but I've let Gus be the judge there. As Augustus is starting to move around more, one of his favorite new things is playing with play silks. For a baby with some gross motor challenges -- see he's rocking his new helmet -- play silks have provided awesome motivation for him to move around. 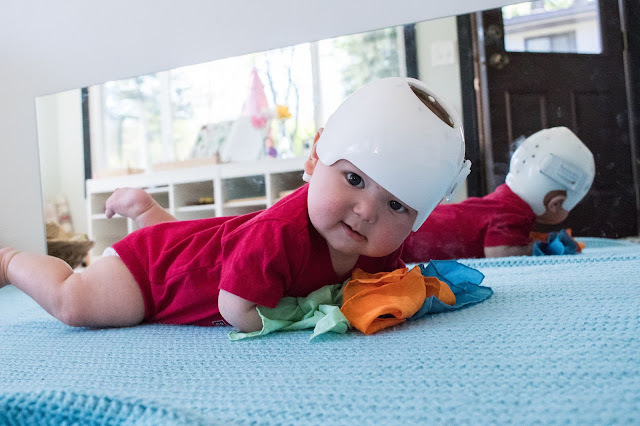 While we have been placing little bits of tented fabric around him for awhile, putting several in different spots on his blanket is new for him. By placing them around, but slightly away from him, he has to move to discover and gather them all. And, he does! And, for a new mover, I like this because the silks are still easy to grab, but don't roll away the same way some other toys -- like the interlocking disks, rolling bell rattle, or a ball will. 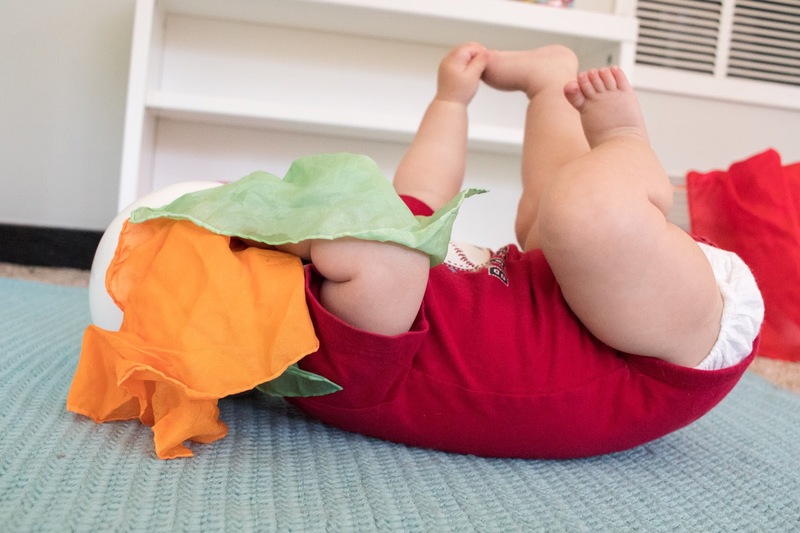 Our silks are DIYed mini-silks so they aren't too big or bulky for a baby to grab. Mini-play silks can also be purchased commercially. Using other small bits of fabric could also work if they are light and airy. So, if you have a new mover, try it! 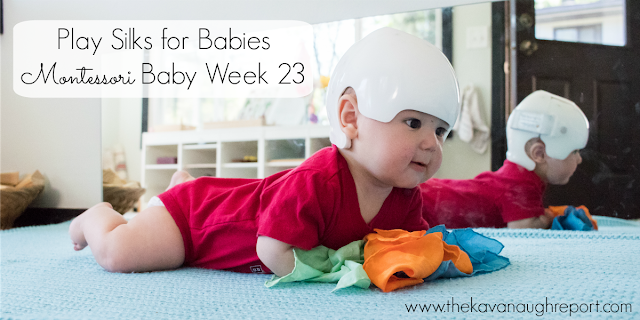 Put a couple of play silks in little "tents" around your baby's movement area. See if he or she moves to discover them and watch how they use them. Then, play a game of peak-a-boo because the silks are perfect for that too! 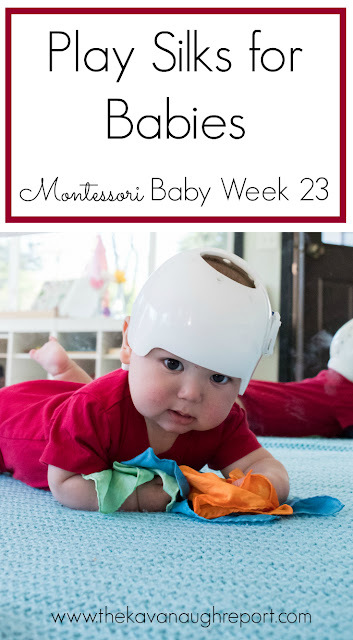 Does your baby enjoy discovery and open ended play? How do you fill this need? sorry for the ignorance, but just wanted to know what the helmet is for? and where did you get it?